The weapon of Ahimsa which Mahatma Gandhi used against the British was a complex weapon which he used with mixed results. Viewed in retrospect, no one can doubt that it did put the colonial British Administration in a tight spot on many occasions. At the same time, no one can also question the fact that it dampened the fire of resistance, characteristic of Hindu society which had waged a relentless war of resistance and survival for almost 1200 years against the successive waves of Muslim invasion and occupation. After the bloody partition of 1947, the sovereign mission of de-Hinduising our nation continued in the guise of Nehruvian Secularism or Nehruvian Stalinism. This essentially anti-national and positively pro-Nehru family philosophy has been accorded the status of high philosophy, even superior to the 'communal' Advita philosophy of Adi Sankara! While the Congress Party under Nehru and Indira Gandhi were committed to the philosophy of de-Hinduising the nation and de-nationalizing the Hindus, several NGOs backed by global forces of Christianity and Islam and several Western powers like Britain and USA entrenched themselves in India after 1955. Later, the Communist Parties of India came to realize the significance of the role of NGOs in modifying or altering the basic structures and contours of our polity and consequently several NGOs wedded to the philosophy of Marxism on paper also joined the fray in this game of de-Hinduisation of India and de-nationalization of the Hindus. The avant-garde book edited by Radha Rajan and Krishen Kak: 'NGOs, Activists and Foreign Funds: Anti-National Industry' brings out the solid truth that many of these NGOs and activists functioning cozily under the safe umbrella of so called peace and human rights activism, cleverly cloak their deep political ambition and objectives - political ambitions not just restricted to participating or influencing electoral politics but aimed at shaping the character and direction of Indian polity in a manner which flows from their warped anti-Hindu, anit-Sanatana Dharma notion of the Indian Nation. Their political ambitions and activism are essentially undemocratic and anti-Indian Nation. Their grass roots activism in many instances is only a fig-leaf for political activism, well funded through an inflow of foreign money. Eminent scholars like R Vaidyanathan, Veera Vaishnava, Narayanan Menon Komerath, Krishen Kak, Nirupama Rajan, George Thondiparambil, Vishal Agarwal, B Raman, and Arvind Lvakare have contributed seminal articles on the subterranean role of national sabotage being played by many of these famous NGOs and the great activists who have won all the global awards excepting perhaps the Nobel Prize. These fearless scholars expose the political and anti-national agenda of some very well-known NGOs and activists and clearly reveal their foreign sponsorships, donors and funds. It proves their double-standard and their total absence of public accountability and stress the urgent public need for the Government of India to ensure a vigorous mechanism to counter this anti-nation and anti-national industry which has spread to all parts of India like the most virulent form of terminal cancer. The NGOs that have been brought under scrutiny include FOIL, AID, ACTIONAID, PARIVARTAN, and ASHA. One of the essays in this igniting book is by R Vaidyanathan entitled 'NGOs: Description and Regulations'. According to him, one of the largest members of the Indian Economic Action Scene is the NGO sector - what is known as the Third Sector (other than Government and Private) in academic circles. What is a non-Government organization (NGO)? A NGO is any voluntary, non-profit, service-oriented citizens' group which is organized on a local, national or international basis. It can be registered as a Society, Trust or Section 25 Company. 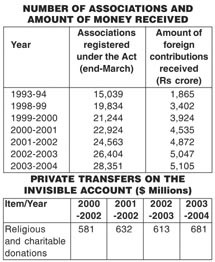 The tables give a synoptic view of the NGO landscape as a whole in India today (pages 41 to 44 of the book under review): Source: India's Invisibles; RBI Bulletin, March 2005. We don't have exact figures relating to the number of persons employed in these nearly 28,500 NGOs in India. One estimate puts it at 19.4 million with West Bengal (1.52 Million), Tamilnadu (1.49 Million) and Delhi (1.03 million) in the forefront. We should not forget the fact that the total number of Government employees is roughly only 20 million in India (Central, State and Local Bodies). Vaidyanathan rightly concludes: 'The type of activities in which the NGOs are involved are mind-boggling. It indicates that the range of concerns of the Third Sector of the NGOs is as large as that of sovereign States'. All the essays in the book under review bring out the unknown aspects of truth about many of the known Kaikayees, Thadagais, Duryodanas, Dushasanas, Kamsans, Hiranya Kasubus and other such globe-trotting Rakshasas and Rakshasis in the world of Indian NGOs today. I can see from the material presented in this book that many of them would eminently qualify for the following historic testimonial to the contemporary members of the Democratic Party in his time in USA, given by Walt Whitman (1819-1892), the great Poet of American Democracy: The members who composed it (any Democratic Party National Convention prior to the Civil War) were seven-eighths of them, the meanest kind of bawling and blowing officeholders, office-seekers, pimps, malignants, conspirators, murderers, fancy-men, custom-house clerks, contractors, kept-editors, spaniels well-trained to carry and fetch, jobbers, dis-unionists, terrorists, mail-riflers, slave-catchers, pushers of slavery, creatures of creatures of the President, creatures of would-be Presidents, spies, bribers, compromisers, lobbyers, sponges, ruined sports, expelled gamblers, policy-backers, Monte-dealers, duelists, carriers of concealed weapons, deaf men, pimpled men, scarred inside with vile disease, gaudy outside with gold chains made from the people's money and harlots' money twisted together; crawling, serpentine men, the lousy combining and born freedom-sellers of the earth. This is not the end, not even the beginning of the end, but only the end of the beginning.